Former President Gloria Macapagal-Arroyo(left) of the Philippines accepts the Award Plaque from our Association representative. Mrs. Gloria Macapagal-Arroyo, former President of the Philippines, stepped down from office in June, Golden Year 7 (2010), having served her country for nine years. To express appreciation to President Arroyo for her tremendous contribution to the country, many celebrations were held in her honor in the Philippines. One of the grandest events was arranged in the main hall of the famous St. Paul University in Manila. As Supreme Master Ching Hai is well-known to the Philippines for the love, care and financial assistance that She has frequently extended to the people there over the years, Madam Cecile Guidote-Alvarez, Chief Executive Officer (CEO) of the National Commission for Culture and Arts, wrote a special letter to Her inviting Her to attend this grand occasion. 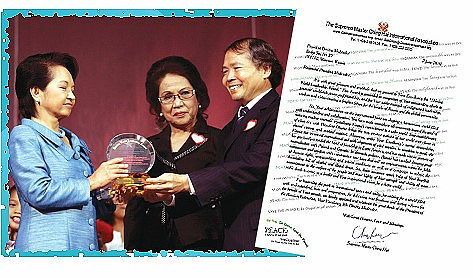 To convey Her gratitude to President Gloria Macapagal-Arroyo for her efforts to uplift the nation, endowed with security and economic stability that has brought prosperity, peace and blessings in addition to creating a bright future for the people, Supreme Master Ching Hai honored her with the Shining World Leadership Award. A spectrum of brilliant entertaining programs performed during the celebration on June 7 showed the deep respect, love and appreciation of the Filipino people from all walks of life towards President Arroyo. 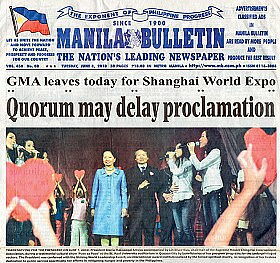 The highlight came when representatives from The Supreme Master Ching Hai International Association presented the Shining World Leadership Award to President Gloria Macapagal-Arroyo on behalf of Supreme Master Ching Hai. The Letter of Commendation written by Master to the President was shown on the big TV screen at the event, bringing heartwarming emotional responses from the participants. Channel 5 of the National Broadcasting Network (NBN) aired the entire celebration. The Manila Bulletin, the No.1 newspaper in the Philippines, and the Presidential Palace official web site also reported the Award presentation.